Why is Prime Minister Stephen Harper Partial to Enbridge’s Northern Gateway Pipelines Project? Anyone relying on the recent words and deeds of Prime Minister Stephen Harper, Natural Resources Minister Joe Oliver, and other federal officials might be excused for wrongly assuming that the shipment of Alberta oil sands crude to Canada’s west coast and thence to Asian markets depends entirely on the approval, construction and operation of Enbridge’s Northern Gateway Pipelines. With noteworthy consistency, their public advocacy of Enbridge’s proposed pipeline system avoids reference to another already in existence. Kinder Morgan, one of Enbridge’s chief competitors, owns and operates the 1150 km long Trans Mountain Pipeline system, which moves crude oil and refined products from Edmonton, Alberta to the Lower Mainland of British Columbia and, by means of its branch Puget Sound Pipeline system, to northwestern Washington State. Trans Mountain has been in operation since the early 1950s. In recent years, 10 per cent of the tankers visiting Trans Mountain’s Port of Vancouver terminal have been bound for Asia. But the Prime Minister and his federal colleagues portray Enbridge’s Northern Gateway project as vital not only to diversifying Canada’s crude oil market but also to accommodating Alberta’s accelerating oil sands production. As they see it, substantially increasing oil sands production is essential to securing Canada’s long-term economic growth and prosperity. Enbridge’s project fits into their grand scheme by adding significantly to the North American pipeline capacity required to move higher volumes of Alberta bitumen to market, and in particular to Asia. Anyone crediting their recent words and deeds would be hard pressed to conclude anything other than that Enbridge’s project is a national imperative. The Enbridge Northern Gateway Project Joint Review Panel: What's Reasonable? "I know of no other book that even attempts to do what Michael Ross's very careful and intelligent legal analysis accomplishes here. Ross's arguments are logically presented and clear, and he makes an important contribution to the literature." *First Nations Sacred Sites in Canada's Courts was shortlisted for the Third Annual George Ryga Award for Social Awareness in Literature (2005). Nicholas Shrubsole, Religion, Land and Democracy in Canadian Indigenous-State Relations, Ph.D. Thesis, University of Waterloo (2013). Sari Graben, "Rationalizing Risks to Cultural Loss in Resource Development," Canadian Journal of Law and Jurisprudence, Volume 26, Number 1, 83-114 (January 2013). Nathan Edward Hume, Constitutional Possibilities: An Inquiry Concerning Constitutionalism in British Columbia, Ph.D. Thesis, University of Toronto (2012). Lauren L. Forbes, Approaching the Unfamiliar: How the Religious Ways of Aboriginal Peoples are Understood in Delgamuukw v. British Columbia (1997), M.A. Thesis, University of Ottawa (2012). Matthew Charles Stamford, The Use of Law in the Destruction of Indigenous Religions in Canada and the United States: A Comparative Perspective, Ph.D. Thesis, University of Sussex (2012). Lauren L. Forbes, "Legal Words are Latent Thoughts: Understanding Discourse Around Aboriginal Religion in Delgamuukw v. British Columbia," Ottawa Journal of Religion, Vol. 3, 3 - 26 (2011). Laura DeVries, Conflict in Caledonia: Aboriginal Land Rights and the Rule of Law, UBC Press (2011). Nicholas D. Shrubsole, "The Sun Dance and the Gustafsen Lake Standoff: Healing Through Resistance and the Danger of Dismissing Religion," The International Indigenous Policy Journal, Volume 2, Issue 4, Article 3 (2011). Marc V. Fonda, "Are they like us, yet? Some thoughts on why religious freedom remains elusive for Aboriginals in North America," The International Indigenous Policy Journal, Volume 2, Issue 4, Article 4 (2011). John R. Welch, Dana Lepofsky, Megan Caldwell, Georgia Combes, and Craig Rust, “Treasure Bearers: Personal Foundations for Effective Leadership in Northern Coast Salish Heritage Stewardship,” Heritage & Society, Volume 4, Number 1, 83 - 114 (2011). Mary-Frances Lynch, Peter N. Duinker, Lorn R. Sheehan and Janet E. Chute, “The Demand for Mi’kmaw Cultural Tourism: Tourist Perspectives,” Tourism Management, Volume 32, Issue 5, 977 - 986 (2011). Monika Kin Gagnon, “Living Archives at the First Nations Garden, Montreal,” Public Journal #41: Gardens (2010). Ghislain Otis, "Droit, culture et autochtonie : le Canada face à l’héritage colonial," Association Henri Capitant, Droit et culture, Bruylant et LBV2, 2010, pp. 373-386 (2010). Robert K. Paterson, “Ancestral Remains in Institutional Collections: Proposals for Reform,” Protection of First Nations Cultural Heritage: Laws, Policy, and Reform, eds. C. Bell and R. Paterson, UBC Press, 155 – 220 (2009). Avigail I. Eisenberg, Reasons of Identity: a Normative Guide to the Political and Legal Assessment of Identity Claims, Oxford University Press (2009). Agnieszka Pawlowska, Using the Global to Support the Local: Community Development at Poplar River and the Establishment of a UNESCO World Heritage Site in Northern Manitoba, M.A. Thesis, University of Manitoba (2009). Laurie E. Adkin, Environmental Conflict and Democracy in Canada, UBC Press (2009). Allan J. Roberts, Connections between Climate Policy and Forests in the Western Climate Initiative Cap-and-Trade System, M.A. Thesis, Queen's University (2009). Jean Leclair, Le droit des successions autochtones: entre liberté et contrainte, La liquidation des successions - Collection Blais 2009, volume 1, Éditions Yvon Blais, pp. 97-178 (2009). Joanne Hammond, Archaeology without Reserve: Indigenous Heritage Stewardship in British Columbia, M.A. Thesis, Simon Fraser University (2009). Kent McNeil, "Native Rights Case Law," Handbook of North American Indians: Indians in Contemporary Society, Volume 2, ed. Garrick Alan Bailey, Smithsonian Institution, 166-176 (2008). Catherine Bell and Val Napoleon, "Introduction, Methodology and Thematic Overview," First Nations Cultural Heritage and Law: Case Studies, Voices and Perspectives, eds. C. Bell & V. Napoleon, UBC Press, 1–32 (2008). Ghislain Otis, “La restitution des terres ancestrales autochtones et les figures de la justice dans le droit international,” Les Cahiers du CIÉRA: La restitution du patrimoine matériel et immatériel: Regards croisés Canada /Mélanésie, eds. Florence Dupré, Frédéric Laugrand et Pierre Maranda, 9 - 19 (2008). Catherine Bell, Graham Statt, Michael Solowan, Allyson Jeffs, and Emily Snyder, "First Nations Cultural Heritage: a Selected Survey of Issues and Initiatives," First Nations Cultural Heritage and Law: Case Studies, Voices and Perspectives, eds. C. Bell & V. Napoleon, UBC Press, 367–414 (2008). Jean Leclair, "Le droit et le sacré ou la recherche d’un point d’appui absolu" (2007). Dwight G. Newman, “Prior Occupation and Schismatic Principles: Toward a Normative Theorization of Aboriginal Title,” 44 Alberta Law Review 779 - 802 (2007). Tracy J. Andrews and Jon Olney, “Potlatch and Powwow: Dynamics of Culture through Lives Lived Dancing,” American Indian Culture and Research Journal, Volume 31, Number 1, 63 - 108 (2007). The sacred sites of indigenous peoples are under increasing threat worldwide as a result of state appropriation of control over ancestral territories, coupled with insatiable demands on lands, waters, and natural resources. Yet because they spiritually anchor indigenous peoples’ relationship with the land, they are crucial to these peoples’ existence, survival, and well-being. Thus, threats to sacred sites are effectively threats to indigenous peoples themselves. In recent decades, First Nations peoples of Canada, like other indigenous peoples, have faced hard choices. Sometimes, they have chosen to grieve in private over the desecration and even destruction of their sacred sites. At other times, they have mounted public protests, ranging from public information campaigns to on-the-ground resistance. Of late, they have also taken their fight to the courts. 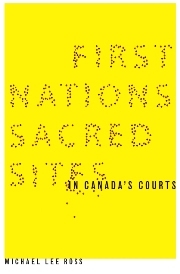 First Nations Sacred Sites in Canada’s Courts is the first work to examine how the courts have responded. Informed by elements of a general theory of sacred sites and supported by a thorough analysis of nearly a dozen cases, the book demonstrates not merely that the courts have failed to treat First Nations sacred sites fairly but also why they have failed to do so. The book does not end on a wholly critical note, however, but suggests practical ways in which courts can improve their handling of the issues. Finally, it shows that Canada too has something profound at stake in the struggle of First Nations peoples for their sacred sites. "Implications of the Recognition of Aboriginal Title," Keynote Presentation, Regional District of Bulkley-Nechako Business Forum, Fort St. James, British Columbia (12 September 2014). “Un espacio constitucional para los pueblos indígenas: la ambivalente experiencia canadiense,” Revista internacional de filosofia politica, (Ejemplar dedicado a: Justicia Intercultural), 39-70 (No. 3, 2009). “Disciplining the Crown on Consultation: The Second Hupacasath Case,” First Nations Summit, North Vancouver, British Columbia (27 November 2008). “Equality Rights and/or Aboriginal Rights? The Inadequacy of the Supreme Court of Canada’s Aboriginal Rights Jurisprudence,” Facultat de Dret, Universitat de Girona. Girona, Spain (22 October 2008). “Creating Constitutional Space for Indigenous Peoples: Canada’s Ambivalence,” Seminario internacional, Justicia intercultural: Conflictos normativos e integración de minorías en las sociedades plurales, Palacio de la Aljafería, Zaragoza, Spain (20-21 October 2008). “Reflections on the Reconciliation of Aboriginal and Non-Aboriginal Peoples in Canada in Light of Aristotle’s Account of Friendship,” Seminario Justicia Intercultural, Centro de Ciencias Humanas y Sociales, Consejo Superior de Investigaciones Científicas, Madrid, Spain (17 October 2008). “Aristotle on ‘Signifying One’ at Metaphysics Γ 4,” Canadian Journal of Philosophy, Volume 25, Number 3, 375 - 394 (1995).